Acupressure can treat many diseases, even the ones related to the eyes. It can also treat many eye ailments which sometimes cannot be treated naturally. Acupressure has been successful in treating Myopia (Short-sightedness), Hypermetropia (long sightedness), cataract, glaucoma, presbyopia, astigmatism, amblyopia (lazy eye), diploma, color blindness, night blindness and many other eye problems. By using the acupressure points correctly one can treat these eye disorders. The main cause for eye muscle tension is neck muscle tension. The immobility of these muscles will cause such kind of conditions in the eyes. Try using these simple acupressure points to clear the eyes and experience, bright and clear eyesight. According to Ancient Chinese beliefs, the eye is closely related to the liver. Some acupressure points in the body are indirectly connected to the eye and accessing them will be of the best benefits. Let us look at some of the most effective acupressure points for healthy eyes. To relax the eye muscles, relieve yourself from headaches and remove the stiffness in your neck, back, shoulders and the whole body, use this acupressure point. You will find this point around the socket of the eyes. Place your index and middle finger on your eyebrows. Rotate them on the edges of your bone. Press gently while rotating for 5 minutes. This is a magical massage as it completely soothing and relaxing. Try it regularly to keep your eyes stress free and healthy. Place your ring finger in the centre of the T junction of the nose. Your finger should be between your eyebrows and right on the bridge of the nose. You can simply press the point for 7 to 8 minutes or massage it gently. Look straight ahead while you massage this point. This point will help to relax eye strain, head aches and nasal congestion. It completely relaxes the nervous system by improving emotional stress and helps in improving eye sight. 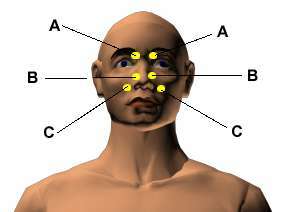 This point can be found near the bridge of the nose under the eyebrows and on the outer side of the eye socket. This point is marked A in the picture. Place your thumbs on both the sides of this pressure point and apply slight pressure. This point helps to relieve fatigue, redness and strain of the eyes. Put your index finger on either side of your nostrils and massage it gently. This point is marked C in the above picture. Your finger should be placed on the edge of your nostrils. You need to press both the sides of your nostrils simultaneously. Repeat this gentle massage for 5 minutes everyday. 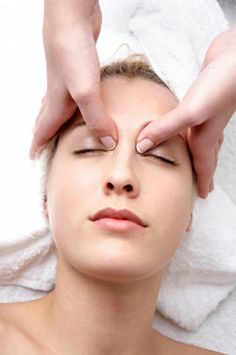 You will be activating all the points around the eyes with this massage. This point will help to prevent unclear vision, head aches, sinus pain and nasal congestion. 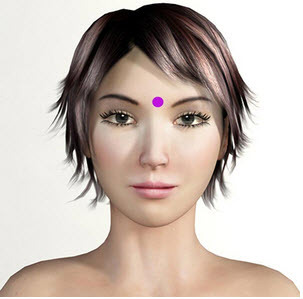 You will find this pressure point on the inner edge of the eyes, near the bridge of the nose. You need to press these points with your index fingers. You can also use a thumb and index finger to apply more pressure on these points. You need to be very careful not to touch the eye balls. Access this point everyday for 3 to 5 minutes to have a clear vision. It will also help to relax the eye muscles. You need to sit in a relaxed position and hold your right hand with your left. With the help of your left thumb, try to rub the tip of your right thumb. The tips of your thumbs are directly related to neck muscles, which help to nourish the eyes. This is a very effective point to strengthen your eye sight. Try to massage both the thumbs regularly for brighter eyesight. You need to access the pressure points on your big toes just like the thumbs. Sit in a relaxed position and hold your right leg with your hands. With the help of your thumbs, gently massage the top of your big toes. You can thumb walk your toe thoroughly for a better blood circulation in the body. This will help to heal different kind of eye ailments. These pressure points can be accessed easily, when ever you have a free hand. 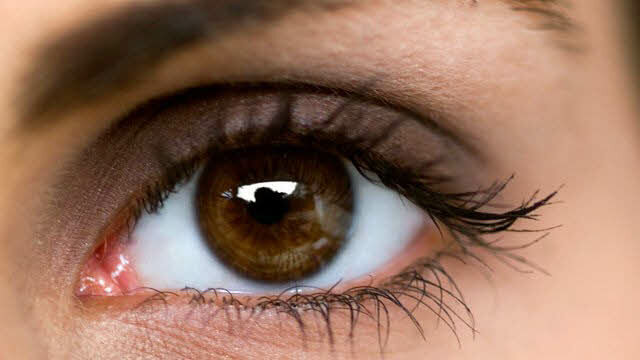 Do try these simple techniques to clear your vision and strengthen your eye sight. Other natural methods can be added to your pressure point routine. In case you are wearing glasses, take them off every now and then to set your eyes free. Try to roll your eyes often to improve the mobility. You can go out into the fresh air for a short walk every day. Keep yourself fit and healthy. Try to avoid staring at the computer or television for long periods of time. Wash off dust from your eyes and avoid anything that strains your eyes. Use the acupressure techniques daily to help cure your sight. If practiced in a proper way, you can even get rid of your glasses in a few days. Keep yourself happy all the time. I had gone to leh Ladakhlast week. From la student 3 days I am having a problem of seeing double images. For last two weeks i had a problem of disturbed vision in my right eye. It gives a hazy picture. On consultation of Eye specialist he finally made comment that blood is not getting circulated at some points. It is choked. So it is not recoverable. Can you give some idea? Just now I saw your consulted with Eye Specialist. According to him your eye is not getting circulated with blood. So for this you have to do Pranayam regularly 15 minutes X 3 times a day. 1 time early in the morning. After doing the Pranayam for 15 minutes then have a warm water (without mixing hot water with cold). This warm water will remove toxins from the blood. And eat carrot and beatroot. Within 7 days you will get improvement without taking any Junk alopathy medicines. The big toe picture shows the second toe. Should we press the toe shown in the picture or the big toe. It’s unfair that so many seasonal-allergy sufferers view spring as time to stay indoors. No more, thanks to acupuncture. This is NOT a substitute for seeing qualified medical personnel, but my experience is that often-with minor eyesight problems–there is a cervical spine connection. In fact, I often will awaken with some blurriness. Yet, after I work on my neck (or see my chiropractic colleague), this usually is resolved in a short time. Acupuncture might help too. It definitely made a difference with resolving some hearing loss about a month ago (along with some Chinese herbs, and chiropractic). I am suffering from allergy of eyes.. Formation of excess mucus.. Which is the best acupressure point to solve this? I want to get rid of glasses. Can you please suggest the exercises? I have keratoconous and I wear contact lenses, my eyesight is deteriorating even with contacts. I am not a candidate for surgery. Please any advice on how to improve my eyesight. Hi My Husband has retinatophy the it cause it the two detached retina in eyes, some scar tissues because the eyes being trying to heal it self and also cataracts in both eyes but the right eye had surgery on it and throughout the eye he can see nothing everything is darker, but he sees shadows, or white if is bright in the places he sees no color no details of people’s faces so the doctor say is nothing the could help his condition. Because is to late.. He got more health problems. Do you have any advise. The I could do to help him for his eyes. Thank you for your website. On going for my eye check up I was advised to go in for laser surgery for my cataracts. Glaucoma is also suspected. Will try this out. We hope it helps you.